Delivery & Courier Service, Birmingham, AL – Wheels On Call Delivers! Wheels on Call Delivery Service offers a custom fit approach to meeting its clients various pick up and delivery needs throughout the Metropolitan Birmingham, Alabama area, the State of Alabama and the surrounding states of the Southeast. Wheels on Call Delivery Service can even handle your delivery needs throughout the United States! Whether you have scheduled or critical time sensitive shipments, Wheels on Call Delivery Service can handle all of your logistics requirements. We provide flexibility along with reliability for our customers. Wheels on Call Delivery Service can deliver any size shipment, 1 lb to 10,000 lbs. We are committed to offering excellent customer service. We will go the extra mile for you! 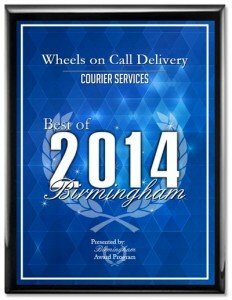 Founded in 2001, Wheels on Call Delivery Service is located in Birmingham, Alabama in Jefferson County. Our drivers are friendly and courteous and will handle your shipment with care and consideration. All of our uniformed drivers are thoroughly screened with drug and alcohol testing, along with a criminal background check. Wheels on Call Delivery Service is licensed and bonded and carries commercial liability insurance on all delivery vehicles.